Stem cell isolation/identification is a critical step in cord blood banking. It affects the number of stem cells that can be harvested or recovered from the cord blood. Cell recovery rates are critical because a higher number of stem cells could enhance the success of the transplant or treatment. That's why Cordlife has invested in the Sepax®2 automated stem cell processing technology which is a safe, sterile and fully automated cord blood processing technology - so you get more stem cells for maximum transplant success^. This Swiss-made and U.S. FDA-cleared device can recover as high as 99.88%1 of Total Nucleated Cells (TNC) from cord blood; up to 57%2 cell count higher than other processing methods. It is also a functionally closed processing system which ensures the sterility of the cord blood by eliminating exposure to air contaminants. Valeri et al., Transfusion 1996; 36: 303-8. Cordlife uses U.S. FDA approved cryogenic storage pouch, with 2 integrally attached segments (20% and 80%) which are in compliance with AABB and FACT-Netcord standards. The dual integrated segments addresses the possibility for future stem cell expansion programmes. This means that when stem cell expansion technology is commercially viable, you can withdraw 80% of the stem cells for immediate use/treatment while continuing to store the 20% balance for future expansion. This storage pouch is made of a special material designed specifically to withstand cryogenic temperature at optimal cryogenic temperature of below -150°C. The integral segments also provide the safety and assurance that additional product testing is performed on the associated unit thereby eliminating testing and cord blood unit mix ups. This is to allow for additional testing of the sample should it be required in the future, or for viability testing prior to a transplant. This storage pouch is made of a special material designed specifically to withstand cryogenic temperatures. Why divide your child's precious stem cells into two cryo bags, and locations and double your risk? As Singapore is geographically small and free from natural disasters, there is no real need to store your baby's cord blood in different locations. Splitting the cord blood unit into multiple bags increases the risk of contamination. The unnecessary location move may heighten the risks of exposing your baby's cord blood to heat, resulting in cellular damage and possibility of sample mix-up. The volume of a cord blood unit does not equate to cell count; splitting into multiple bags does not guarantee more stem cells. The success of a stem cell transplant largely depends on the amount of stem cells used in the treatment; splitting and storing of cord blood in multiple bags does not guarantee multiple treatments. 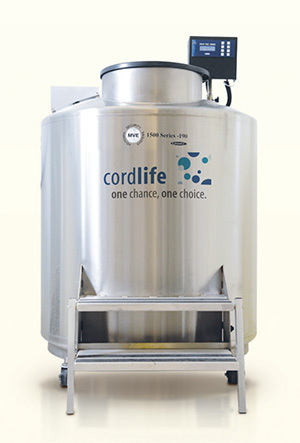 Cordlife also uses MVE Anti-contamination Vapour-phase Liquid Nitrogen Storage System for long-term stem cell cryopreservation. 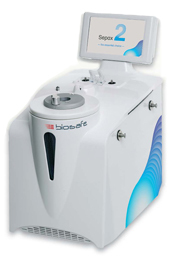 Vapour-phase storage is preferred over liquid-phase storage as it eliminates the chance of cross contamination between cord blood units as compared with those stored in liquid nitrogen. Over 99% of private cord blood banks also use vapour-phase freezers.